A pleasing 4K IPS panel at a price. Not a proper professional screen, nor an obvious choice for gaming. But it does a lot of things well—at a price. Unless you're spending big, big money, buying a monitor is almost always about compromises. 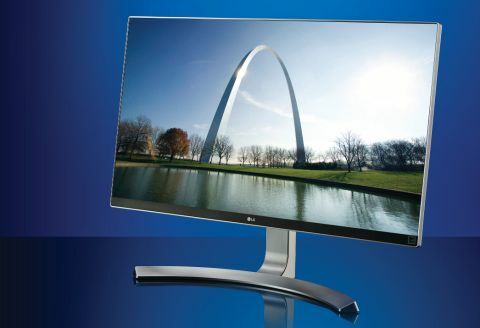 LG’s new 27UD88 monitor has one big selling point: its 4K resolution. But for a fairly standard 4K monitor it's pricey, with a list price of around $700 (although you can find it online for a cheaper $550). It measures just 27 inches across, is limited to 60Hz refresh, and doesn’t support HDR. For now, the combination of 4K with high refresh, HDR, and a really large panel isn’t available. In fact, the combo of just 4K and high refresh is still a little around the corner. In the meantime, what has LG rustled up to justify a fairly stiff sticker price for such a modestly proportioned panel? After all, 27-inch 4K monitors can be had for under $300. For starters, the 27UD88 packs a quality IPS panel, while cheap 4K monitors make do with TN tech, and thus inferior colors, contrast, and viewing angles. The 27UD88 also offers a little something to please graphics pros. There’s support for 99 percent of the sRGB color space and 10-bit color depth, though the latter is thanks to dithering, rather than native support. The panel itself is eight bits per channel. It's going to look great, but probably isn't enough to please professional photographers. Another nifty feature is the upstream USB Type-C port with DisplayPort alternate mode capability. The idea here is to hook up a laptop and do everything over a single cable. That includes drive the display, charge the laptop, and enable the monitor’s USB hub for connecting peripherals. If using a laptop as your main rig and hooking it up to external displays is your thing, and you have a USB C-enabled portable, this LG promises to make docking super-simple. You also get support for AMD’s FreeSync tech for smoother gaming and no screen tearing. Just remember that requires an AMD GPU. Tying it all together is LG’s best effort at a premium look: a brushed metal effect stand (actually plastic), a moderately trendy screen enclosure in white plastic, and fairly thin bezels. But what about the actual visuals? While the 27-inch proportions may be modest, the upside in combination with the 4K resolution is a nice, tight pixel grid. That means lots of detail, and nice sharp fonts. More generally, the panel has a relatively subdued character. It’s more natural than particularly punchy. Moreover, the standard factory calibration is nicely judged, with ample detail in black and white scales, and perfectly smooth gradients. The 27UD88 also gets a brownie point for delivering decent contrast for this class of panel. True, a VA panel typically offers deeper blacks, but the 27UD88 doesn’t suffer from the excess of light bleed that blights its sibling, the 38-inch LG 38UC99. As for the USB Type-C with alternate DisplayPort mode, that failed to function with our test system, an Apple MacBook with its single USB C port. Whether that reflects a problem with the monitor or MacBook was impossible to determine. Our advice would be a little Googling to search for any issues specific to your laptop, rather than assuming all will be well. The overall upshot is a pleasing, fairly versatile monitor. It doesn’t excel in any area. It’s not a proper professional screen, nor an obvious choice for gaming. But it doesn’t do anything badly, and it does a lot of things well—at a price.